John Allen Shares Why He is Supporting the Red Cross! 2010 is coming to a close and as we look back, your local American Red Cross Lakeland Chapter has had an extremely busy month and we need your support more than even. From November 15-December 23 the American Red Cross Lakeland Chapter has responded to 17 incidences helping a total of 79 people with their immediate emergency needs. We have also provided food, water, coffee and snacks to 435 emergency workers at multiply incidences within the community. Hear John talk first hand on why he is supporting the Red Cross and check out his progress on the dance floor with his partner Taylor Watry. Murphy in the Morning: Why He is Dancing for the American Red Cross…. And what do you think, Is he really “sandbagging” ???? Vote for my Mommy, Aymee Balison Please! Did you know that the American Red Cross has a Pet First Aid Class? Don’t forget about us dogs and cats. By being trained you can help save our life too. This is just one of the many lifesaving courses that are offered by the American Red Cross Health and Safety Department. By voting for my Mom, you are helping to provide the needed funds to educate our community on how to prevent, prepare for and respond to emergencies. Want to learn more about the Dog and Cat First Aid Course? Call the Health and Safety Department at 920-227-4290. Course Content: Designed to protect both the pet owner and the pet as well as the pet caretakers and their pet clients (dogs and cats) from further harm, injury or suffering during emergencies by teaching prompt, effective actions and care that will safeguard the life of an injured pet. 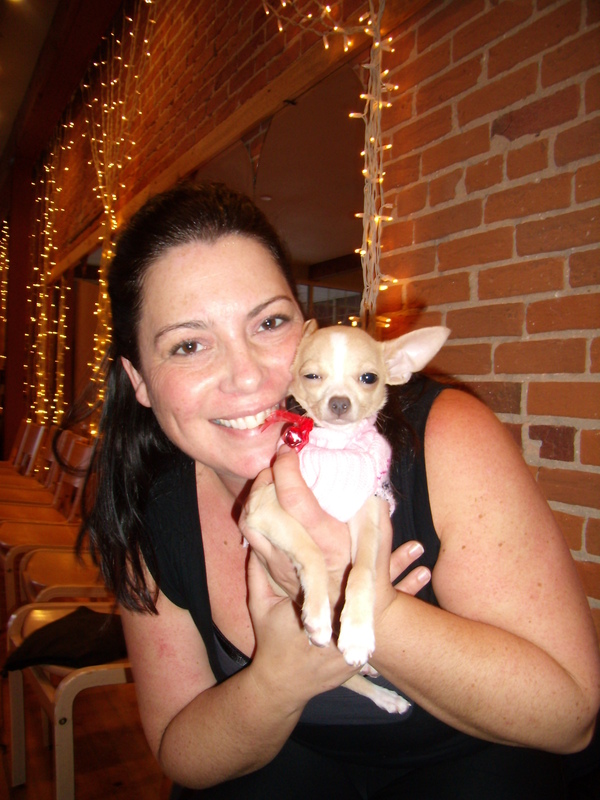 The course is taught by a licensed veterinarian. Participants should indicate if they want the dog first aid booklet/DVD or the cat first aid booklet/DVD. Stacy Richards, Spicing things up with her Samba! FYI: Having a little technical difficulty with the sound for this video. If it doesn’t play, right away, view the video the full size of your screen and it should play. Hello Northeast Wisconsin! Your favorite on-air personality Murphy in the Morning, Morning show host 101 WIXX, is putting his two feet to work (instead of his mouth) for the Dancing with the Stars for the American Red Cross. Check out the latest video of Murphy working on his Waltz. This will be one of the two dances Murphy will be performing at the Saturday, February 26 event at the Radisson Hotel and Conference Center, Three Clans Complex, in Green Bay. Want to show your support! All you have to do is VOTE (donate). 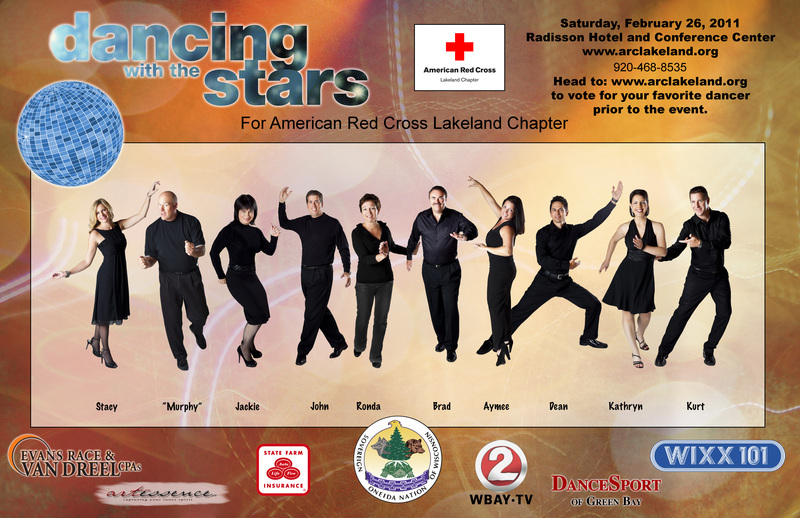 Thank you Dan Frievalt and Teri Shevy of artessence, LLC for taking these beautiful pictures of our dancers and creating this fun poster for the 3rd Annual Dancing with the Stars for the American Red Cross.